Iris: So you think The Flash is out there right now, searching for Eddie? Barry: I’m sure he’s doing everything he can to find him. 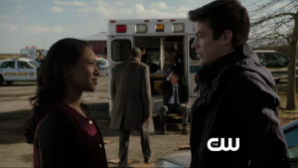 Iris: Yeah, well, I’m finding it pretty hard to trust The Flash right now. Barry: Well, then, trust me. Barry: I’m gonna get Eddie back, I swear. Iris: Yeah, The Flash said the same thing. “Grodd Lives” begins with a question about trust. 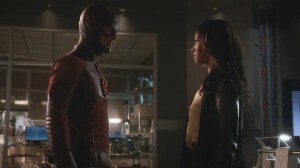 After finding out Barry is The Flash Iris opens the episode with her own voiceover, her second of the season, where she asks us to imagine that our best friend has been keeping “a universe of secrets” from us. She invites us to empathize with her, invites us to understand the world of The Flash from her point of view.